I was very excited yesterday to see tht one of my two favourite singers is touring New Zealand for the first time in 20 years. 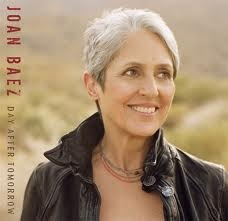 Not only is Joan Baez coming to NZ but one of her two concerts is in Wellington. Yes I did go on line and buy tickets immediately - but then the laundry flooded so it was an hour before I knew I had tickets to the August concert. Her son will be one of the accompanists. Incredible to think she has been singing in public for literally all my life - 54 years since she made her first public appearance. in that time she has marched with Martin Luther King, inspired Vaclav Havel in his fight for a Czech Republic, sang on the first Amnesty International tour and stood alongside Nelson Mandela at his 90th birthday. She and Steve Jobs were a couple in the 80s - wonder if her healthier lifestyle might have given him a longer life? Tony was laughing at me. But like my iPad being the only piece of technology I have ever craved (and have used daily since I got it in 2011), my love of music is very narrow but intense. I may let Tony use the second ticket - if he promises not to mock me. As my other favourite singer is dead it is unlikely I will ever get to hear Harry Chapin live in concert!